Portrait of a cocker spaniel and grey tabby cat. 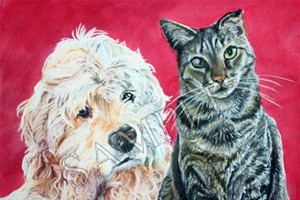 When you are a pet portrait artist, you get to hear all sorts of stories of how the owners obtained their pets. Here is one story that I think is worthy of posting. This is about the cat named Napoleon in the portrait above. Some years back, when Napoleon was a small kitten, not even old enough to explore this world or for that matter have his first glimpse of it, someone took him away from his mother. They took him for a ride in a car, then tossed him out of the moving car and sped away. Little Napoleon hurled down and hit the pavement. The impact was so hard that the little kitten bounced when he hit the pavement, then lay lifelessly on the road. A witness to this horrendous event ran over to the tiny kitten and realized that he was still alive. So he gently picked up the little kitten and rushed him to the vet. The vet did what he could to patch up the little kitten and take care of his needs. But he soon realized, being a single practitioner, that he could not continue to devote around the clock care to this little guy and also run his practice. Things looked bleak for little Napoleon. Then, one of his regular customers came in for a routine checkup of her dogs. She asked about the little bandaged kitten in the corner of his office and the vet told her what had happened. She immediately offered to help out with the kitten. The vet cautioned her that there was a very good possibility that the kitten would not live. The kitten was only two weeks old, maybe younger and it is very hard to keep even a healthy kitten this young alive without the mother. It would need around the clock care. Also, he warned that he had no way of knowing what the extent of the injuries were. Even if the kitten did survive it may be severely handicapped. Undaunted by the odds, the lady was willing to take on the challenge. The vet showed her everything she needed to know to take care of the kitten. Armed with this knowledge, she took little Napoleon home. She and her husband took shifts during the night to take care of him. As I am sure you realize, Napoleon survived. He is a small cat with a crumpled ear and white scare tissue over one of his eyes. He doesn't have the agility or balance of most cats. And being blind in one eye makes him have poor depth perception, but this has never kept him from trying. His owners tell me that he often misses his mark when he tries to jump up on a chair, sofa, etc. But dispite all the hardships in his youth, he turned out to be an intelligent and very loving, friendly cat.